A Walker n-manifold is a semi-Riemannian n-manifold, which admits a field of parallel null r-planes, with r ≤ . It is well-known that semi-Riemannian geometry has an important tool to describe spacetime events. Therefore, solutions of some structures about 4-Walker manifold can be used to explain spacetime singularities. Then, here we present complex and paracomplex analogues of Lagrangian and Hamiltonian mechanical systems on 4-Walker manifold. Finally, the geometrical-physical results related to complex (paracomplex) mechanical systems are also discussed. where indicates the symplectic form. The triple (TQ, , X) is called a Lagrangian system on the tangent bundle TQ. where Φ indicates the symplectic form. 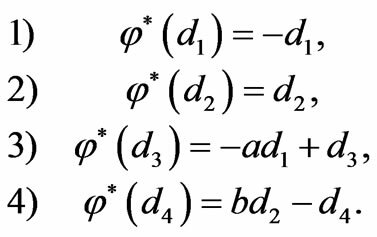 The triple (T*Q, Φ, X) is called a Hamiltonian system on the cotangent bundle T*Q.
Nowadays, there are many studies about Lagrangian and Hamiltonian dynamics, mechanics, formalisms, systems and equations [1-5] and there in. There are real, complex, paracomplex and other analogues. As we know it is possible to produce different analogues in different spaces. Let be a Riemannian manifold with a neutral metric, i.e. 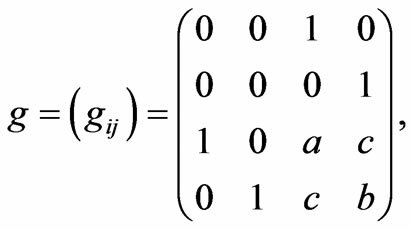 with a semi-Riemannian metric g of signature (n, n). 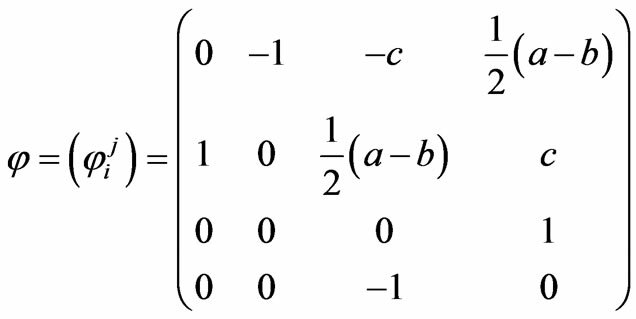 By a Walker n-manifold, we mean a semi-Riemannian manifold which admits a field of parallel null r-planes, with The canonical forms of the metrics were investigated by Walker . Special interest manifolds are Walker manifolds of even dimensions (n = 2m) admitting a field of null planes of maximum dimensionality (r = m). An application of such a 4-dimensional Walker metric is given in . Since the observation of the existence of almost complex structure on Walker 4-manifolds in , the Walker 4-manifolds and the almost Hermitian structures on the four-manifolds have been intensively studied, e.g., [9-14], etc. In this study, we present complex (paracomplex) analogues of Lagrangian and Hamiltonian mechanical systems on 4-Walker manifold. In the end, some geometrical-physical results about the obtained complex (paracomplex) mechanical systems are also given. Throughout this paper, all mathematical objects and mappings are assumed to be smooth, i.e. infinitely differentiable and Einstein convention of summarizing is adopted. Denote by a Walker manifold. 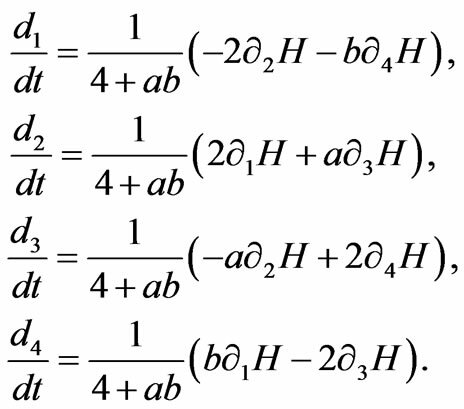 Then , and are the set of functions on M4, the set of vector fields on M4 and the set of 1-forms on M4, respectively. 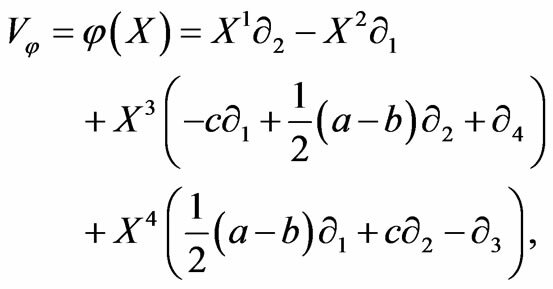 where a, b, c are smooth functions of the coordinates (x1, x2, x3, x4). 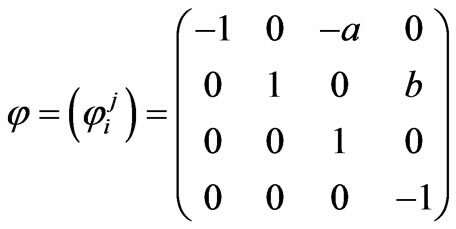 The parallel null 2-plane D is spanned locally by , where are the abbreviated forms of i = x1, x2, x3, x4. We easily see that the above three properties defines φ uniquely, i.e. with respect to the natural frame . where di are the abbreviated forms of dxi, i = x1, x2, x3, x4. Now, our purpose is to obtain complex Euler-Lagrange equations for relativistic, quantum and classical mechanics on 4-dimensional Walker manifold M4. which is named Liouville vector field on the Walker manifold M4. The maps given by such that , are said to be the kinetic energy and the potential energy of the system, respectively. 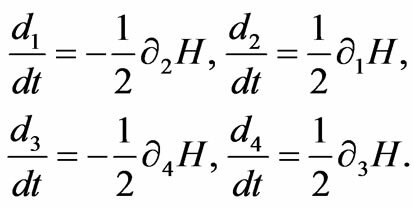 Here mi, g and h stand for mass of a mechanical system having m particles, the gravity acceleration and distance to the origin of a mechanical system on Walker manifold M4, respectively. Then is a map that satisfies the conditions; 1) is a Lagrangian function, 2) the function determined by is energy function. such that the equations calculated in (10) are named complex Euler-Lagrange equations constructed on Walker manifold M4 if 2-form is symplectic structure. Thus the triple is named a complex mechanical system on Walker manifold M4. 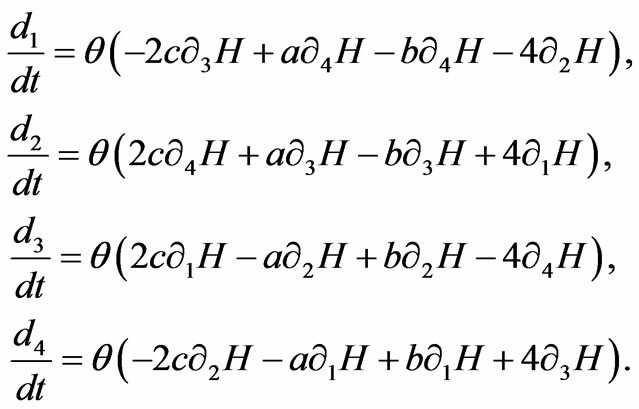 then the equations in (10) have a solution. This section is devoted to present complex Hamiltonian equations and Hamiltonian mechanical systems for relativistic, quantum and classical mechanics constructed on Walker manifold M4. As is known that if Φ is a closed form on Walker manifold M4, then Φ is also a symplectic structure on Walker manifold M4 . Hence, the equations introduced in (21) are named complex Hamiltonian equations on Walker manifold M4 if Φ is a symplectic structure. Then the triple is named a complex Hamiltonian mechanical system on Walker manifold M4. 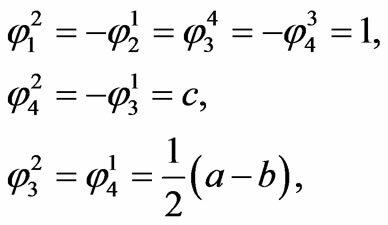 We obtain the following corollary considering the equations found in (21) using Remark (p. 387) in  and Proposition 4 in  and Corollary 4 in . 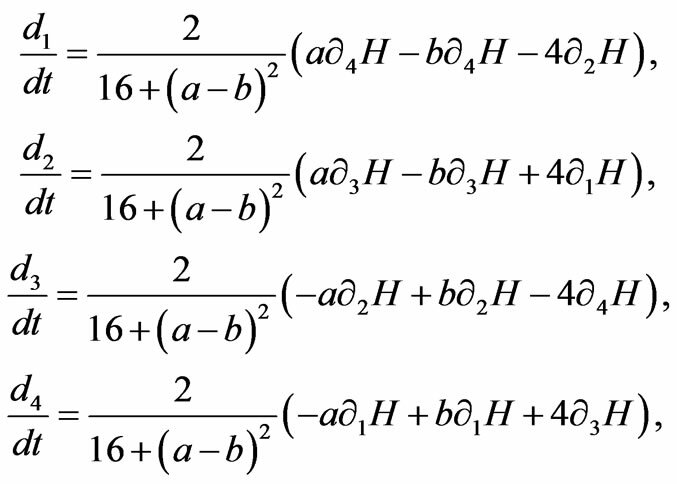 then the equations in (21) have a solution. In this section, we produce a paracomplex analogues of Lagrangian and Hamiltonian mechanical systems on a Walker manifold M4. where , i = x1, x2, x3, x4. denotes the coordinate bases . 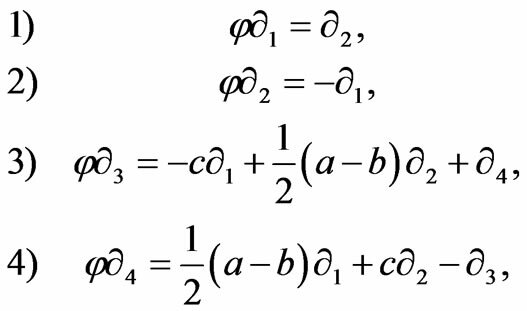 such that the equations calculated in (25) are named a paracomplex Euler-Lagrange equations constructed on the Walker manifold M4 if the 2-form is symplectic structure. Hence the triple is named a paracomplex mechanical system on the Walker manifold M4. 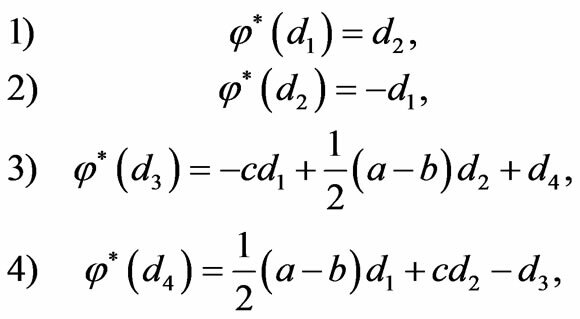 Hence, the equations introduced in (27) are named a paracomplex Hamiltonian equations on the Walker manifold M4 if the 2-form is symplectic structure. Then the triple is named a paracomplex Hamiltonian mechanical system on the Walker manifold M4. From above, complex and paracomplex Lagrangian mechanical systems have intrinsically been described on a Walker manifold M4: The paths of semispray X on Walker manifold M4 are the solutions of complex and paracomplex Euler-Lagrange equations raised in (10) and (25). Also, complex and paracomplex Hamiltonian mechanical systems have intrinsically been described on a Walker manifold M4. The paths of Hamilton vector field X on the Walker manifold M4 are the solutions of complex and paracomplex Hamiltonian equations raised in (21) and (27). 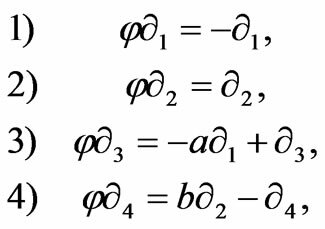 One easily see that the complex (paracomplex) EulerLagrange and Hamilton equations introduced in [4,5] are equivalent those in (10) and (21) ((25) and (27)) if a = b = 0. One can be proved that the here obtained equations are very important to explain the space-time mechanicalphysical problems. 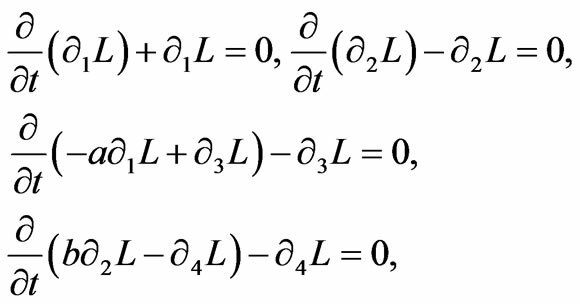 Therefore, the found equations are only considered to be a first step to realize how complex (paracomplex) structures on a Walker manifold has been used in solving problems in different physical areas. 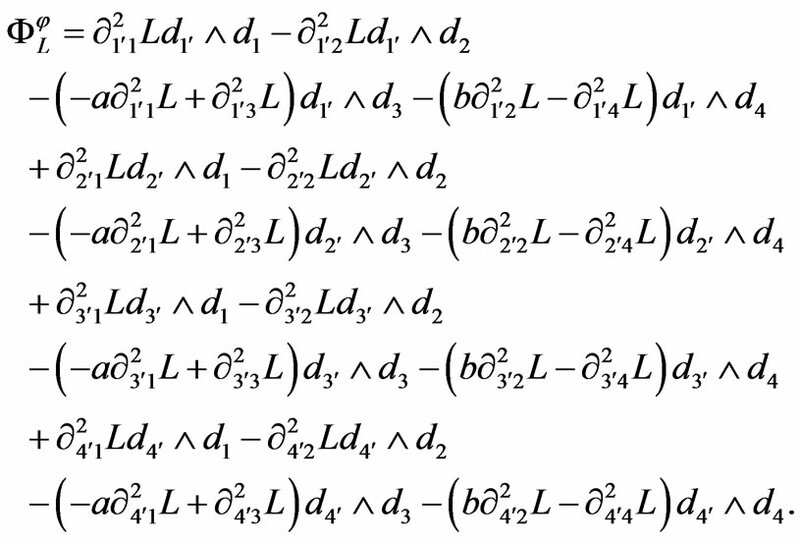 For further research, the complex (paracomplex) Lagrangian and Hamiltonian mechanical equations derived here are suggested to deal with problems in electrical, magnetical and gravitational fields of relativistic, quantum and classical mechanics of physics. J. C. Diaz-Ramos, E. Garcia-Rio and R. VazquezLorenzo, “Osserman Metrics on Walker 4-Manifolds Equipped with a Para-Hermitian Structure,” Matematica Contemporanea, Vol. 30, 2006, pp. 91-108. E. Garca-Ro, Z. Raki and M. E. Vazquez-Abal, “FourDimensional Indefinite Kähler Osserman Manifolds,” Journal of Mathematical Physics, Vol. 46, 2005, Article ID 073505, pp. 1-11.